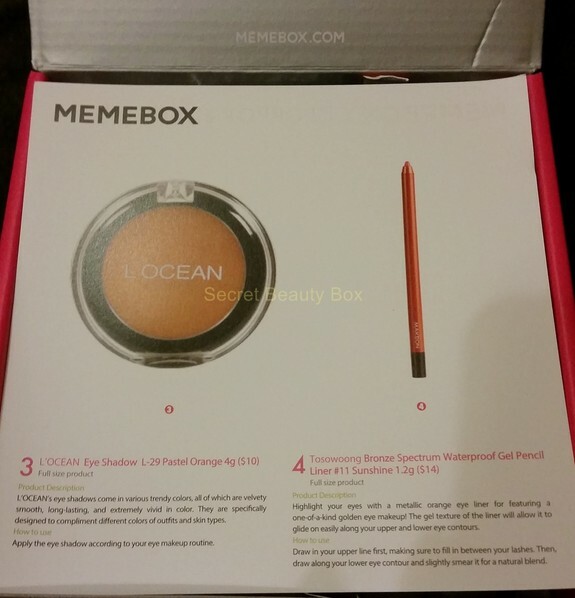 I was recently contacted by Memebox (pronounced Me, Me Box) who asked if I would be interested in trying one of their boxes to review. Of course I was very excited about this and snapped up the opportunity. I had not actually heard of Memebox before they had got in touch with me. So I had a little look at their website and was excited to see that it was Korean beauty products, and I have always wanted the chance to be able to try some. Memebox curates only the most trusted, best-loved Korean beauty products at everyday prices. An extremely competitive industry, Korean cosmetics are renowned for their unprecedented quality developed through cutting-edge technology. At the forefront of the industry, Memebox is determined to deliver the enchantment of discovery through effortless experiences, at prices you’ll never say no to. The box I was sent was the Color Box #2, price of the box is $15.00 plus $6.99 shipping, approx £12.82, which I think is a fantastic price. In the box I received 4 Full Sized products, which came to the value of $39 approx £22.73. I love the fact they ship to the UK for only $6.99, this makes their boxes so accessible. They have a very large variety of boxes you can choose from and they also ship to 45 countries! 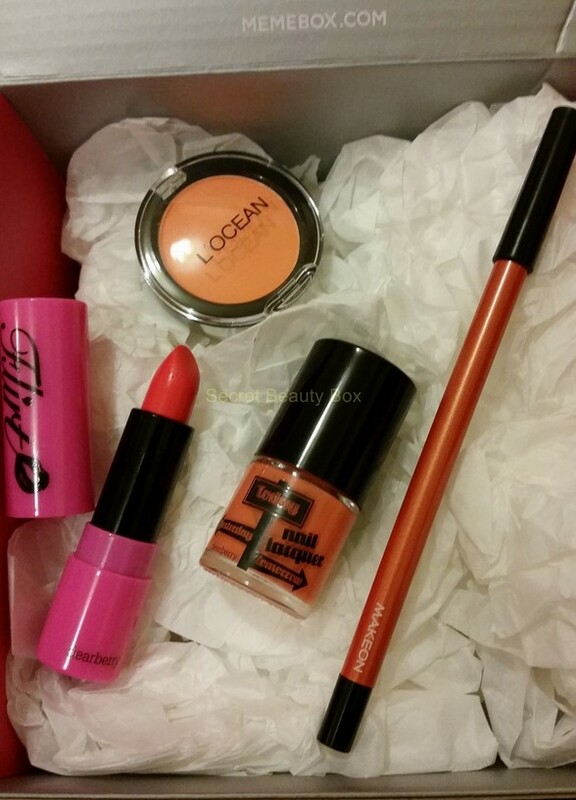 I was scared to receive an orange lipstick, but it is more a blood orange colour, so more red than orange. It works a bit like a lip stain as well as its that vivid and a strong colour, it lasts a long time on. It has lots of natural ingredients, Olive oil, cocoa butter and cupuacu butter. It has a buttery smooth texture, and you don’t need to apply much to obtain full coverage. I am happy with this product and I love the bright pink packaging!! Very girly! I received colour #20 Fantasy. It is a nice coral orange, which is fantastic for the summer. It is very easy to apply and gives good coverage with just one coat, but I still apply two coats. The Today Nail Laquer series offer over 40 different shades, so lots of colours to pick from. This is a great colour, not too sure how I will use it though as I don’t often wear orange. It applies very easily, and is velvety smooth. 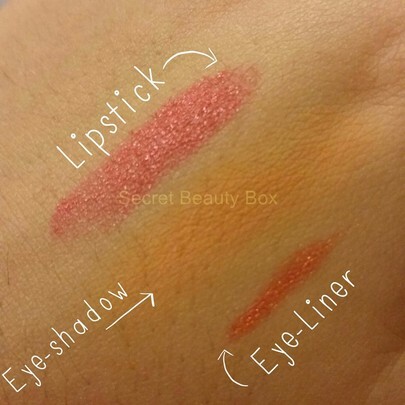 You can tell it is a good quality eyeshadow and will be long-lasting. This is a waterproof gel eyeliner, in a metallic orange colour. It looks bronze in colour, and it very easy to apply and easy to blend as well. This will be good to add a bit of brightness to your eyes. At first I was unsure how you sharpen this, as the pencil itself is plastic, after looking it up it appears you just sharpen it like any normal wooden pencil. That will be interesting to try when I need to. I like this product, and it will come on handy for the summer. So I was impressed with this little box, and I have already ordered another one! I can’t wait for that one to be shipped. What I love the most is the prices! They are very cheap considering they are coming from Korea, and I get to try products I wouldn’t normally try. I was a bit unsure about getting the Colorbox #2 Orange, but I was pleasantly surprised, and these are products I could actually use. I was scared of the colour orange, as it is something I would never normally wear. The boxes are very cute and bright pink, they come very well packaged and there were no customs charges which is great. You don’t sign up to a monthly box, you just chose from the vast choice they have on their website, and you can order as many or as little as you want! But you still get the surprise of the monthly boxes where you don’t know exactly what products you will receive. The original Memebox comes packed with 4 – 8 full-size products and deluxe samples. Boxes in each Memebox series always contain the same products, and contents vary from hair and body products, to skin-care and makeup products. Superbox was inspired by our Memebox lovers, looking for full-sized products catered to specific needs. Each Superbox series comes with its own theme, designed to target particular concerns, or collaboration with our favorite brands! We created Luckybox to give everyone a different and unique box full of our favorite products for you to feel like the luckiest person in the world! Every Luckybox is unique and is filled with 4 – 8 full sized products and deluxe samples carefully curated from Korea to give you the best experience and widest exposure to a range of products! 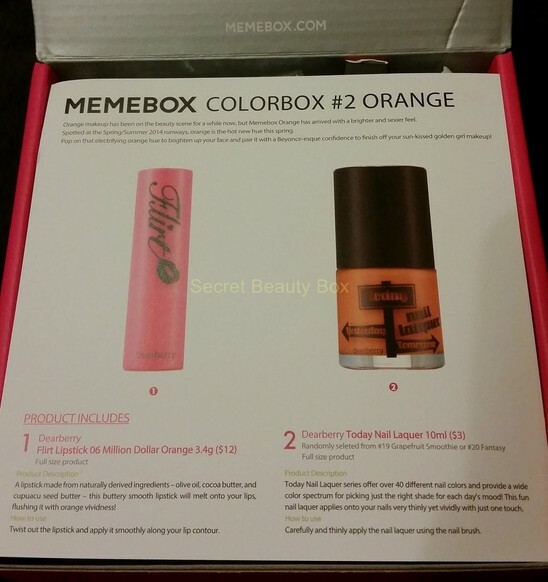 If you would like to give Memebox a try use the code TRYMEMEBOX for $15.00 off your first order.